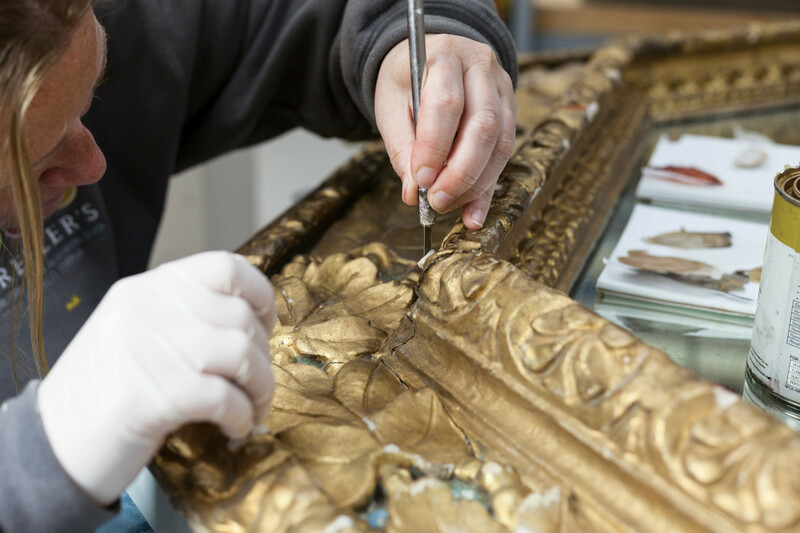 Artisan, Laura Sheehan, removes old gold leaf and glue from a frame before regilding it. A well-made piece of furniture is a form of art. Yet, because furniture is also functional, at some point it may need to be restored. That antique armchair has scuffed, gouged legs. The cane on an heirloom sofa has punctured. Or, the veneer on a side table has buckled or fallen off. 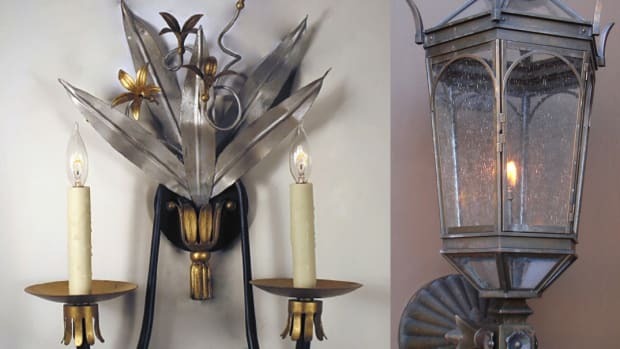 To bring these items back to their original luster, a company like Trefler’s in Newton, Massachusetts, comes to the rescue. “We are the oldest and largest full-service collective [of] restoration companies in the United States,” says president David Manzi. “There are many furniture restoration companies that are larger than us, many decorative art restoration companies that are larger than us, upholsterers—but, collectively, we are the largest.” In addition to restoring furniture for individuals and families, Trefler’s repairs and restores books, porcelain, china, glass, crystal, and metal decorative arts, along with fine arts. 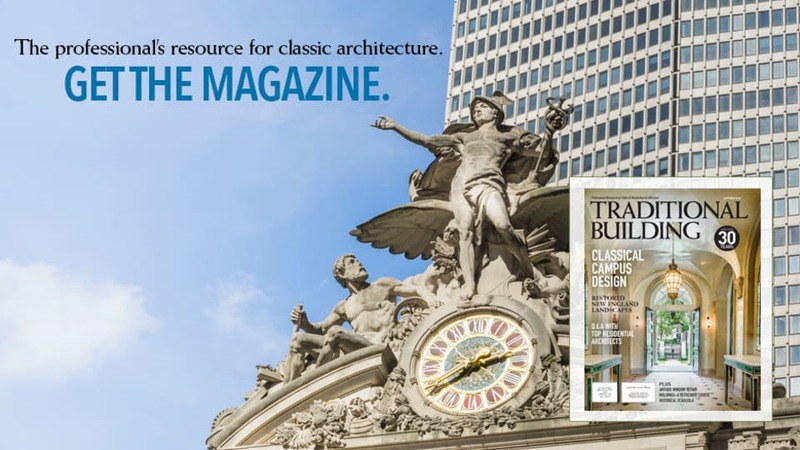 Trefler’s works with corporate clients, such as Four Seasons and Harvard University, doing everything from refinishing a table to repairing a spindle on a chair. Trefler’s does custom framing, custom upholstery, fine art packing, shipping, storing, and installation, and will professionally photograph items for archival or insurance purposes. They even work with the trade to provide architects and designers with custom furniture, finishes, and restoration. Restorer, Bernard Murphy, applies finish to a chair’s splat, making sure the color mimics the original. The story of Trefler’s dates back to 1921 when Abraham Trefler opened a shop to fix transit radios, knickknacks, and small pieces of furniture in his native country of Germany. His son, Eric, who managed to survive the prison camps in Poland and Germany during World War 11, eventually continued the business after moving to New York and then Boston, where he began restoring furniture for various antique dealers before going out on his own. “Eric developed his own type of epoxy,” says Manzi. “It was basically a combination of different bonding agents and it’s a product we still use today.” While much of Eric Trefler’s early business centered around repairing crystal, china, porcelain, stone, and metal items, furniture became a dominant focus in the 1980’s, mainly thanks to Leon Trefler, one of Eric’s sons and brother to Alan Trefler (who now owns Trefler’s with his wife Pam). 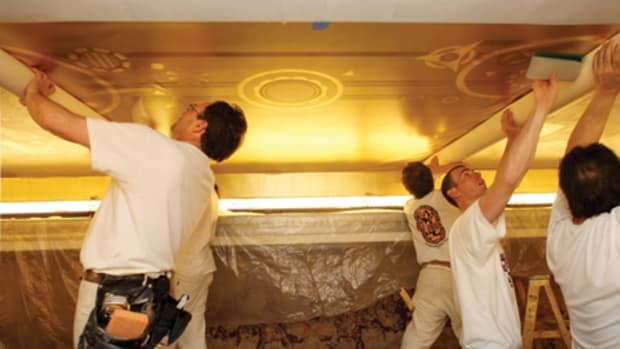 Leon Trefler had the clever idea of connecting with insurance companies eventually positioning Trefler’s as the go-to expert throughout New England for repairing furniture harmed in transit or afflicted with fire or water damage. 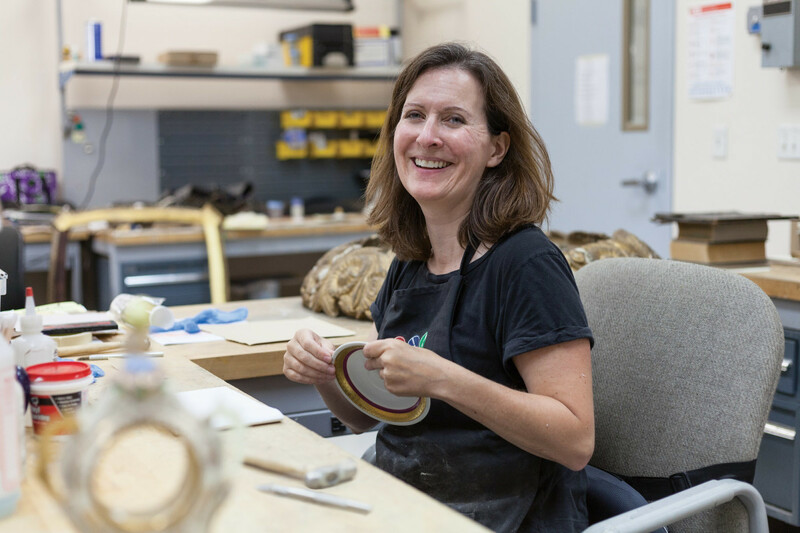 “Our conservators are just incredible,” says Manzi. “They are considered art conservator technicians and have backgrounds in art history and other related fields. 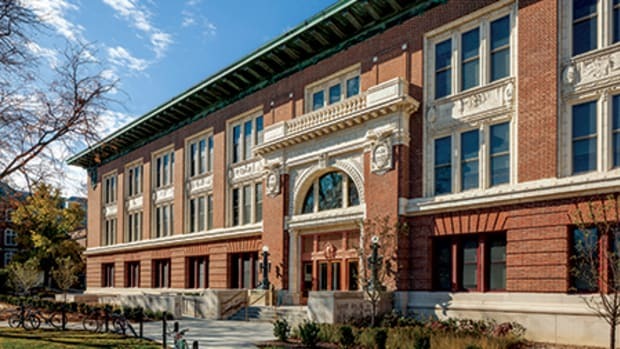 A lot of our woodworkers have gone to the North Bennet Street School” in Boston and some staff members have been with the company for 20-35 years. 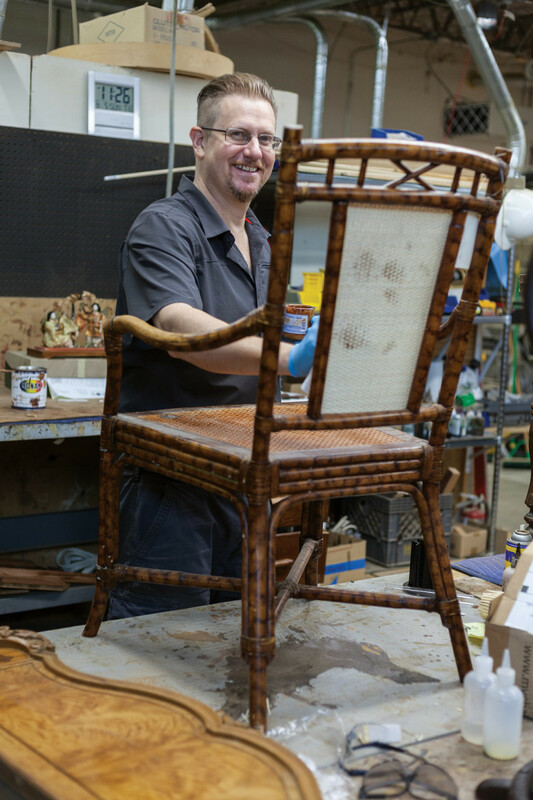 To refinish a chair, a restorer strips off the color and sands away imperfections. Peeking inside Trefler’s chalk-white workshops on a recent week-day morning reveals how much work goes into restoring a piece. 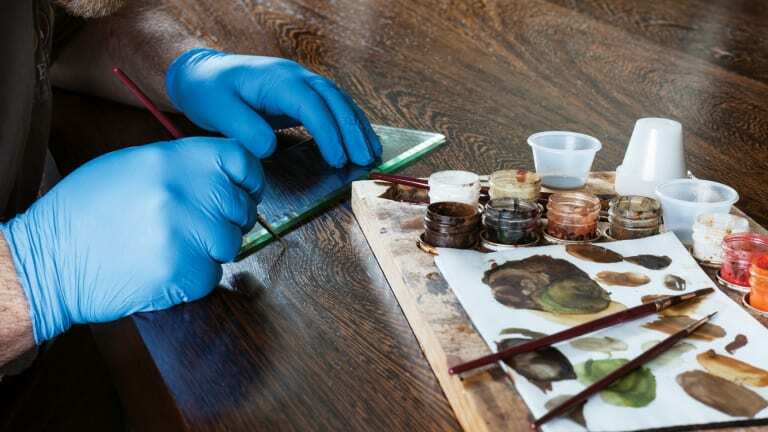 Kody Kirkland, a professional photographer and Head Art Handler, who’s been at Trefler’s since 2017 after graduating from Massachusetts College of Art and Design in Boston, explains what he’s done to rejuvenate an Asian, black lacquer cabinet embellished with shiny gold figures, animals, and birds. “It came in with areas that were raised and cracked or the lacquer had come off,” says Kirkland. “It’s a private piece and the owner wanted it touched up and brought back to life.” Trefler’s offers a variety of restoration solutions at various price points, including stripping the piece down to the original wood and refinishing it or simply keeping the furniture’s old look, but making it functional. For the cabinet, Kirkland glued down loose parts and reattached a leg. Then, he’d filled in cracks and missing decorative areas with wood epoxy, sanding the epoxy down as close to the surrounding shiny black lacquer as possible without scratching it. “I painted this,” he says pointing to a long-tailed bird with tiny black feather lines. “I recreated it by matching the style of another bird and the piece’s overall artistry.” Kirkland also refreshed the cabinet’s black lacquer background but with paint, not lacquer, to stay within budget. 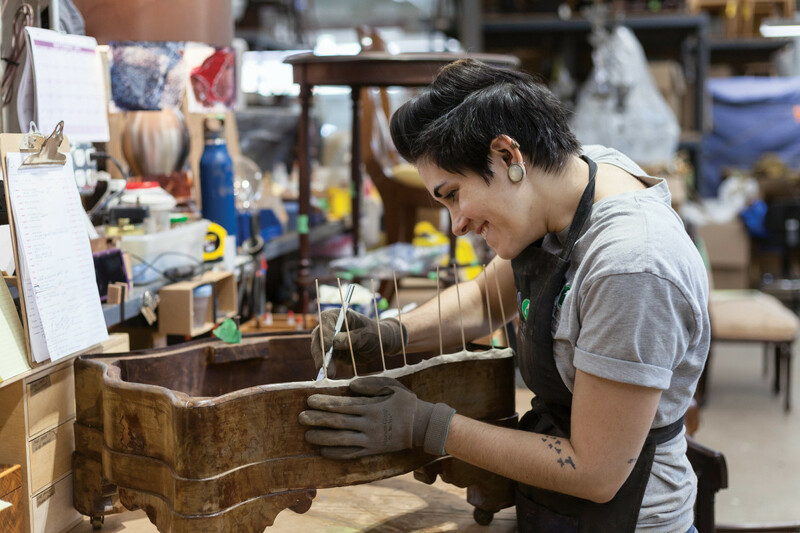 Artisan, Meaghan McNalley, works with adhesive on a small marble-topped table before the top is fitted into place. “My photography experience helped me color match this piece,” Kirkland says, referring to the paint mixture. “It looks black, but it actually has an orange tinge.” According to Kirkland, he will restore the piece to the client’s agreed-upon quote, then show the piece to the client who will decide whether or not to continue restorations. Nearby, Conservator Chris Keiffer works on a drop front secretary. 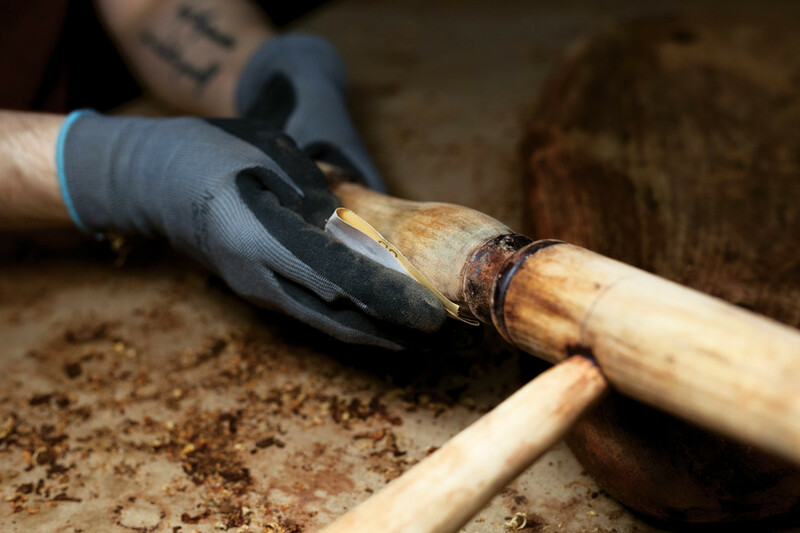 With a background in carpentry, he joined Trefler’s 2014 as a delivery person, learning restoration skills from fellow conservators until he was promoted. “This piece was really in rough shape [when it arrived],” says Keiffer, referring to the secretary. “The finish was old and uneven and the drawers wouldn’t close smoothly. Lots of veneer was missing and the drawer runner was broken.” So, Keiffer first tackled the structural issues, including recreating a new runner. He added new wood veneer to the larger veneer sections and for the smaller ones recreated veneer by carefully painting the epoxy and putty to match the original veneer. “One side [of the piece] was facing the sun and had gotten faded,” continues Keiffer, “so I sanded it down and then mixed a dye and patted it on. Once the color matched, I put on shellac and finished it with a French polish, a method of adding layers and layers of shellac to give it a mirror finish.” All in all, Keiffer spent approximately ten hours restoring the piece, which gleams like a buffed chestnut. Keiffer runs his hand across the desk’s lid. In another studio, Bernard Murphy, Conservator and Head of Art Framing, stands in front of a mustard-yellow chest painted with colorful medieval court figures. Craftsman, Sarah Robison, applies filler to the back of a plate in order to remove a chip. “This chest was in someone’s family,” says Murphy, opening the lid. “The father made and painted it around the 1900s. There was paint loss on the figures and scene design and the whole piece had darkened due to the accumulation of grime and oils over time.” Thus, Murphy lightened the chest’s overall artwork and patched and repainted various parts, like the missing head on a male figure. “We also are repainting the crest,” says Murphy. “We will create a new one based on finding similar crests, showing the client and fine-tuning it to her desires.” Finally, Murphy and his team will build a base to raise the chest. According to Manzi, the bulk of what Trefler’s currently restores is furniture and mainly family heirlooms. “I’d say 90 percent of our business is sentimental,” says Manzi. “I don’t really help many people out front when they come in, but I am always amazed to hear that people are spending hundreds of dollars on even something their grandchild made. 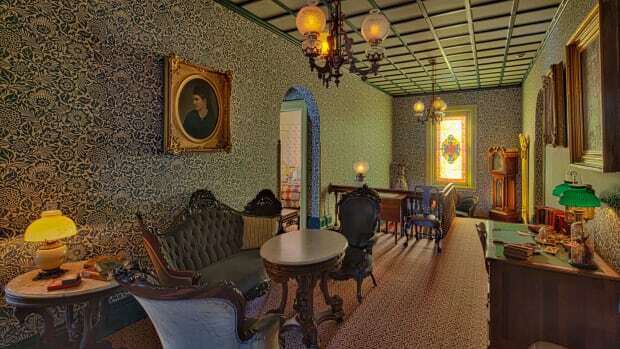 We don’t appraise—that would be a conflict of interest—but if people want to spend the money [on restorations], I am glad they’re doing that for their family.” The Trefler Way, of course.